Rips currents are the major cause of swimmer difficulties. 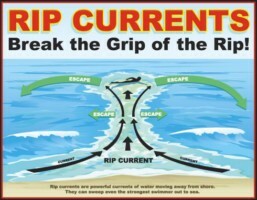 A rip current is usually as a result of large sets of waves approaching the beach and building up water which later returns to sea to even out water levels. The larger the surf the more intense the rip current. Next time remember to "SWIM BETWEEN THE FLAGS"
Everything from earthquakes to ship wakes create waves; but the most common cause is wind. As wind passes over the water's surface, friction forces it to ripple. The strength of the wind, the distance the wind blows & the length of the gust determine how big the ripples will become. As the wave approaches shallow water, wave height increases and the crests become more peaked. The forward speed of the crest becomes faster than the speed of the wave, and the wave breaks. Dumping or Plunging waves break with a tremendous force and can throw a swimmer to the bottom. They usually occur at low tide. This wave is dangerous and is a common cause of spinal injuries. Surging waves may never actually break as they approach the waters edge. Surging waves can knock swimmers off their feet and carry them back into deep water. For this reason they can be very dangerous especially around rocks. Spilling waves occur when the crest of the wave tumbles down the face (front) of the wave. Generally, spilling waves are the safest waves. The rise and fall of the tides are caused by the pulling effect of the Sun and Moon's gravity on the Earth. Because the Moon is much closer to Earth than the Sun, its influence is much greater. When the Moon is overhead at any place, it pulls the water beneath it outwards into a bulge. A similar bulge on the opposite side of the Earth is caused by the water being thrown outward by the planet's spin. These two bulges travel around the globe, producing (in most places) two high tides every day. A 'Spring tide' is a very high High tide and a very low Low Tide. It occurs twice a month, at a full moon and a new moon. A 'Neap tide' occurs twice per month also, during the cresent (¼) and gibbous (¾) phases of the moon. A neap tide results in the level of the tide changing very little between low and high tide.